This is almost too easy to be a real recipe. I chopped up about 2 TBSP of red onions and sautéed in 1 TBSP of olive oil. When they caramelized, I added 5 brussels sprouts that I had chopped up. I sautéed just until warm and added 2 TBSP of Trader Joe’s Tomatoless Corn Salsa. 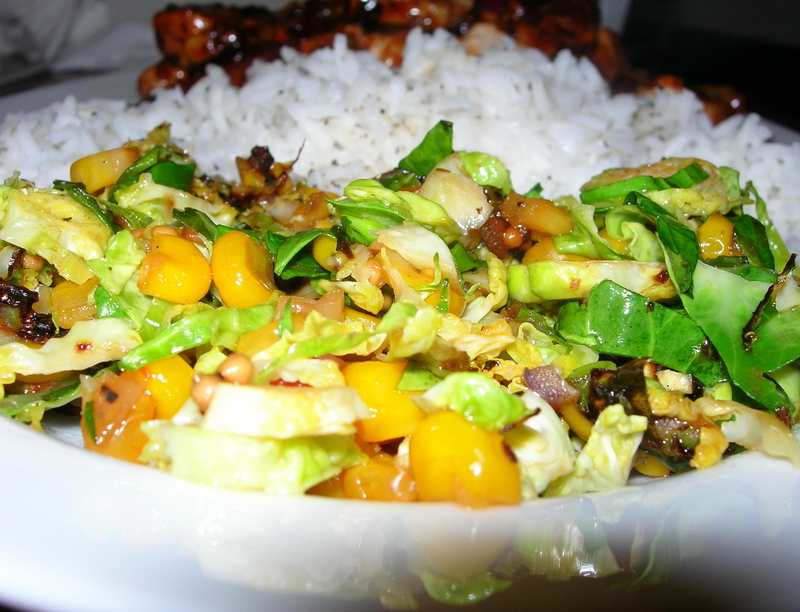 The corn adds crunch and sweetness, the salsa has a sweet/hot flavor and the brussels sprouts provide a hearty base. It was delicious. 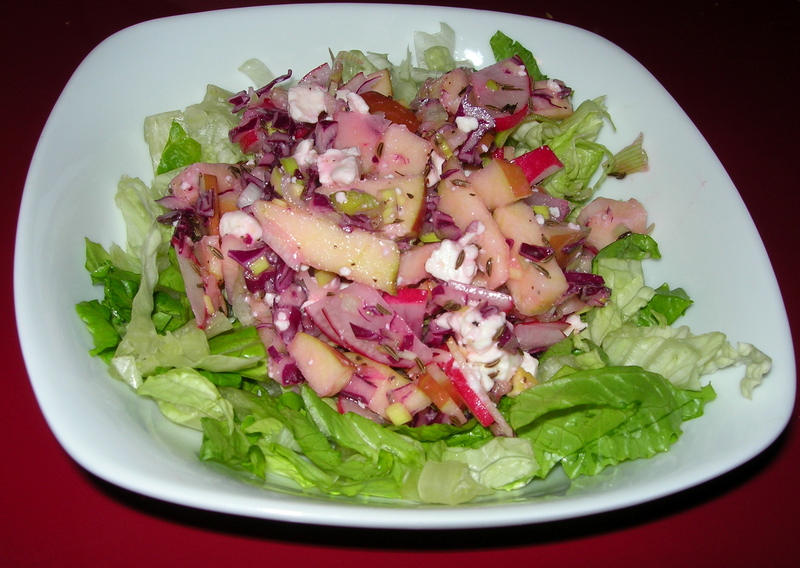 This is a simple chop salad. I chopped 1/2 parsnip and 2 carrots into matchsticks. I added 2 TBSP of red onions, 5 brussels sprouts, chopped, 1 apple cored and chopped and 2 TBSP of chopped fresh parsley. I added some salt and pepper, 1 TBSP of walnut oil and the fresh-squeeze juice of 1/2 a lemon. I let the flavors marry overnight and ate the next day. 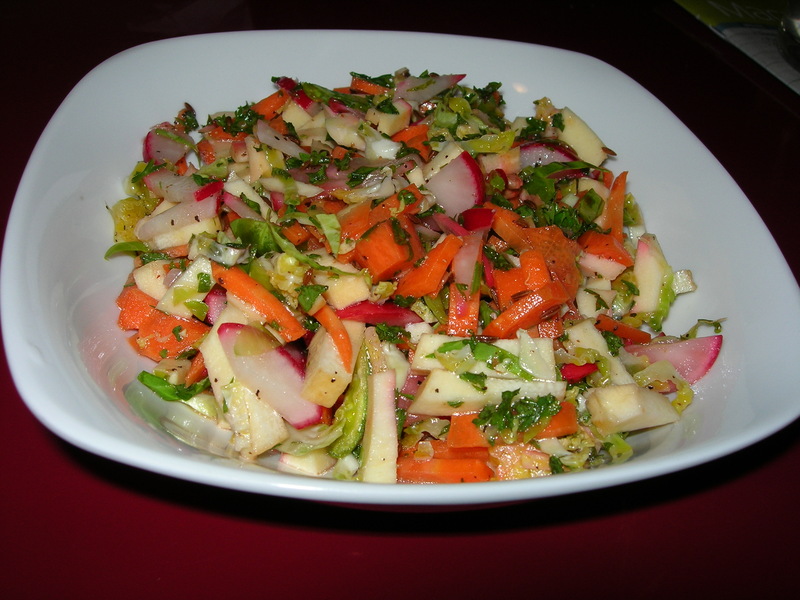 It was a crisp, crunchy mix of heat from the radishes and onions with sweetness from the carrots and apples and hearty umame from the parsley and brussels sprouts and that special bright tartness of parsnips. With its crunchiness, it makes a great snack for late night TV watching. I was talking with my best friend about how much I like the combination of grapefruit and anise seed that I used in the salad the day before and speculated that it could be tasty with just about anything. We were talking about different options and it occurred to me that a cabbage slaw might be delicious. She thought brining the cabbage might work really well, but I decided for something simpler and crunchier. I hope she tries her own flavor combo. If she does and she shares, I will tell you how it goes. For this, I shredded about 1/4 of large head of red cabbage. This was about 8 cups or so of shredded cabbage. I sprinkled salt on it, stirred and let it set for a few hours. Then I drained the liquid from the cabbage. This softens the cabbage and removes a lot of liquid so that it holds up better. I then added 1 small red onion, sliced thin on a mandolin and chopped into smaller pieces. I loved the color combo with the cabbage. The onion is white with pruple while the cabbage is purple with white. They look beautiful together. I added 2 small carrots, shredded and 2 tsp of anise seed, 1 TBSP of olive oil and 2 tsp of apple cider vinegar. I mixed it all well together and let sit for 30 minutes to marry. I supremed a grapefruit, removing all pith, skin and peel. I squeezed all the juice out of the skin remnants and stirred it in, then sliced the segments into thirds and tossed lightly. 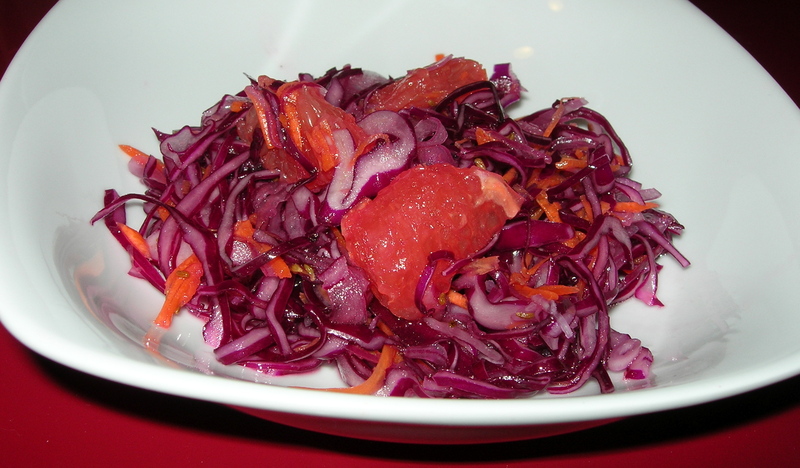 This makes a very pretty salad that is light and crunchy with a subtle citrus flavor balanced with sweetness of anise seed and the heartiness of carrots and cabbage and the tang of red onions. 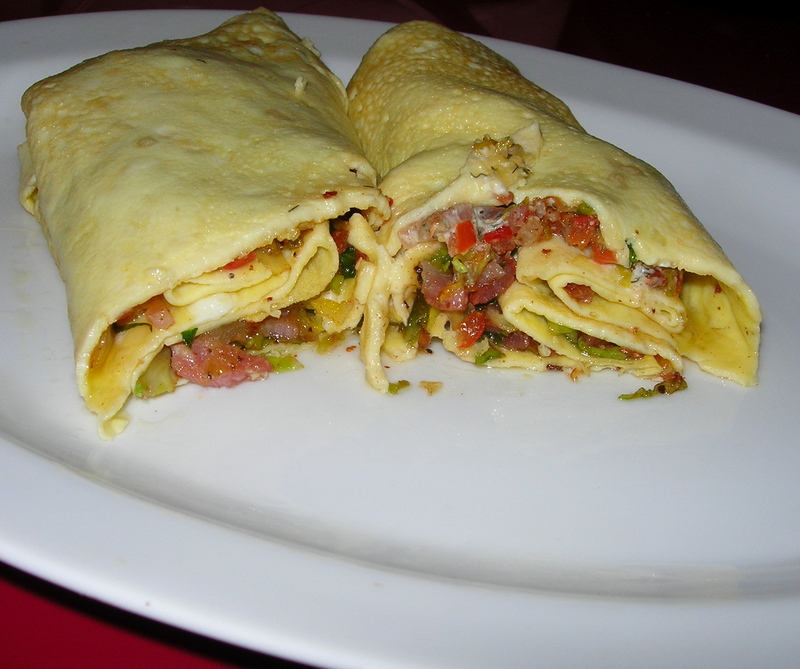 It’s a burst of flavor in your mouth and will only improve for tomorrow and the next day. This made 8 servings of salad, but it keeps beautifully. This was a quick and easy 15 minute salad. I put 1 TBSP of olive oil on medium heat in a sauté pan and added 1 tsp of anise seed and a pinch of cardamom. While they heated I chopped two tbsp of red onions and 10 brussels sprouts. I added them to the oil once the air was perfumed by the spices and turned the heat down to just below medium. While they were cooking, I chopped up 2 tbsp of fresh mint into small pieces and supremed a grapefruit. To supreme a grapefruit, cut off the top and bottom and slice away the peel so you remove all the skin. Then using a sharp knife, cut out the segments so there is no skin attached. When I was done, I tossed in the mint and squeezed all the juice out of the leftover center and skin of the grapefruit into the pan, stirring lightly. You only want to warm the vegetables so they are not too crunchy, but are still toothsome. After removing from the heat, I added the grapefruit segments and stirred, adding just a touch of salt. If there were ever flavors meant to be together, they are anise seed, mint and grapefruit. Candy manufacturers could make some hard candy sucker with their flavor. 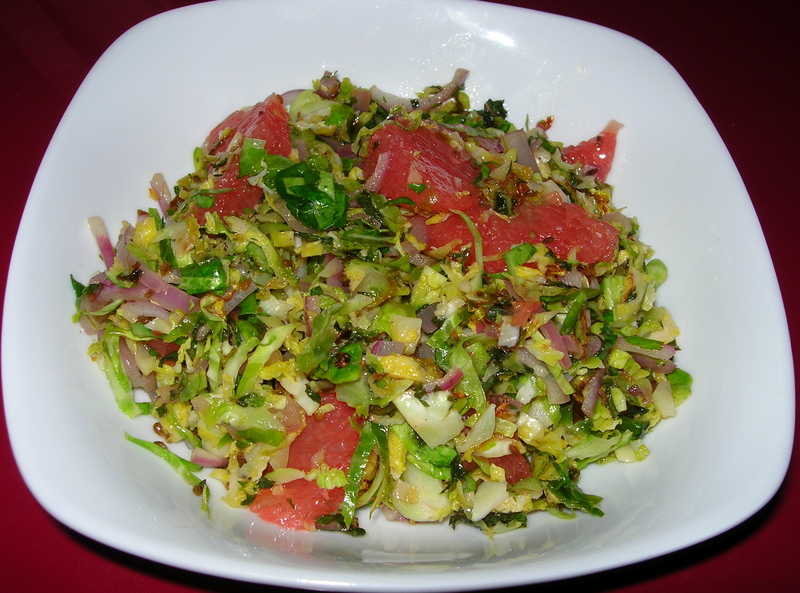 The brussels sprout and red onion add just enough bite and earthiness to balance that rich, perfumed sweetness of the grapefruit. Yum! Makes one large salad, or two small side salads.